The headline making, Google Android-based video game console Ouya is due out before the end of 2013 but it won’t be alone in the market. Just in time for the Consumer Electronics Show, a number of new consoles have been announced. Ouya won’t just be competing with Nintendo Wii U, Microsoft’s next Xbox, and Sony’s next-generation PlayStation but other Android-based consoles as well. Chief among them: GameStick. The proposed Android game console is little more than a controller and a small dongle roughly the size of a USB flash drive that plugs into a television’s HDMI port. (The prototype controller and console are pictured above. The company claims that around 200 existing Android games will work with the GameStick and its controller, while developers like Disney and Dead Trigger makers Madfinger are planning to support the platform. At $79, the console undercuts the $99 Ouya. PlayJam is aiming to have the device out to customers by April. 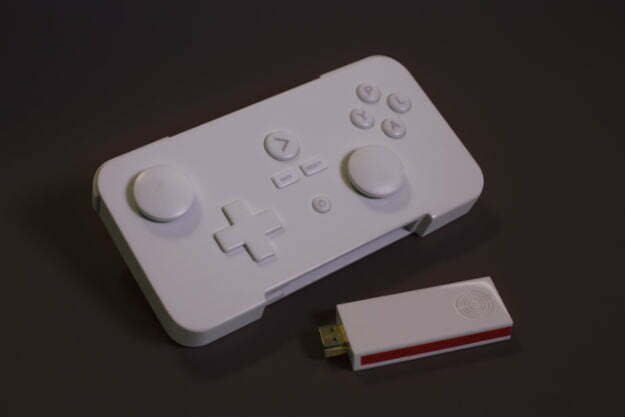 GameStick uses the Jelly Bean version of Android and uses dual-core CPU and GPUs developed by ARM with 1GB of memory. Storage memory is somewhat limited, with just 4GB of flash storage inside the stick and 8GB of micro-SD card memory. There’s definitely interest in GameStick. PlayJam passed its $100,000 goal just over 24 hours after opening the Kickstarter campaign, funds from more than 1,000 backers. That’s hardly the $8.5 million raised by Ouya last summer, but it’s still a market. What’s really working in PlayJam’s favor is its background in the Smart TV industry. Its platform is used for games on a number of manufacturer’s televisions, including LG, Samsung, and Sony. It’s also got a decent pedigree in the games industry. Criterion (Need For Speed: Most Wanted) co-founder Adam Billyard is the company’s current chief technology officer. Ouya is also scheduled to come out in April, and with a lot more press behind it, PlayJam’s GameStick has some catching up to do. With CES just days away, it’s likely these two won’t be the only Android consoles gunning for audiences this year. The Nintendo Switch's handheld mode is more than a convenient way to play games -- it's also the preferable way for some titles. Here are 15 Nintendo Switch games you should play in handheld mode.